I purchased this R-IDSC-E/R SCSI to IDE converter as part of some IDE to CF experiments. The goal was to use CF in older SCSI systems. 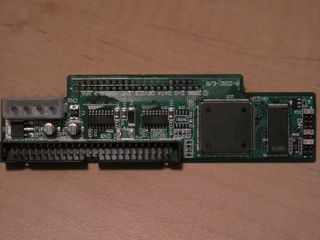 The R-IDSC-E/R is a SCSI to PATA IDE converter board, claimed to be a successor to the IDSC21-E, both made by I-O Data. I-O Data does not reference these devices, however the wayback machine finds this. The jumper setting document is mirrored locally here At the bottom of this page are the features and specifications as listed by the seller. There is a block of 9 jumpers on the R-IDSC-E/R for configuring it. The jumper setting PDF for the IDSC21-E lists 10 jumpers, but jumper position 0 has been omitted on my board. Jumper 1 on my board is indicated by a small triangle next to the jumper block. 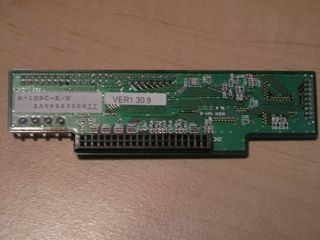 Jumper 1 is on the "top" of the board on the same edge as the 50 pin SCSI connector. To get started, start with the basics. Set the SCSI ID jumpers (1-3) appropriately, and set the SCSI termination as desired (jumper 9). When connecting a hard disk, set jumper 5. Additionally, if your hard disk supports UDMA (most do), set jumper 7. You should be good to go at this point. The original goal was to use an IDE-CF adapter with this device in order to to use CF as the hard disk for SCSI systems. Since most CF cards to not support UDMA, jumper 7 should be left off so the converter will use PIO mode. I've also found setting it to SCSI-1 with jumpers 4 and 5 set, 6 unset, works well for the macs I've tried it in. However, I have had problems with the Mac formatting software, even third party, initializing the drive. I've had good luck with Lido. This model manufacturing uses Pb solder process. Not 100% for RoHS. 20MB/S, 10MB/S, 5MB/S (Synchronization) transmitting, Asynchronous transmitting. If installed with two 256 byte FIFO, transmission will be smooth without overhead between IDE to SCSI. Disconnecting and reconnecting functions available.